This Design wall is my Mother's, Betty's wall. She was away when Orca Bay mystery got started in Nov but when she got home in Dec she was speedy. She used Green instead of Red and Coral instead of Blue. She has just a few crabby eye pieces to do and then she is ready to sew her rows together. I thought some of you would like to see a different colour way. I have added my post today to the Design Wall Monday over at Patchwork Times and Bonnie Hunter at Quiltville is doing a final linky thing for our Orca Bay Mystery. Check them both out as there will be many to see. Here is my Design wall today. The same it was three weeks ago. I have not been feeling 100% and have not had the energy to sew the rows together. I have been working on customer quilting on the week days and in the evenings I might get a little sewing for myself but I have been working on my scrap challenge. I posted Saturday on my new blocks in Green. They both look wonderful. Looks like quilters in Alberta liked the mystery!!! What a great mother-daughter project! I know what you mean about lacking the energy to sew those long rows together. I like how your mom's colorway looks! Both are terrific. Love to see it in the different color ways. Love them both! Thanks for sharing them. I think they both look great but I love how serene your mother's is - green is one of my favourite colours! They both look great! Hope you are feeling better soon. Sewing into rows is my least favorite part of putting a quilt together. 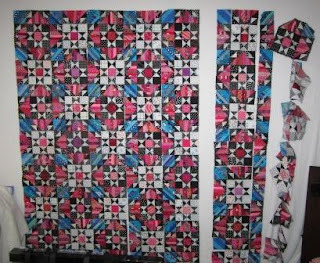 Both great quilts, and fun to see different colors in the same post. It would be hard to pick a favorite, they are both beautiful. Looks great Cathy and Betty. Jobs well done. Going to be an impressive S & T night if they all show up at the same time...perhaps we could plan on that. Something to think about. 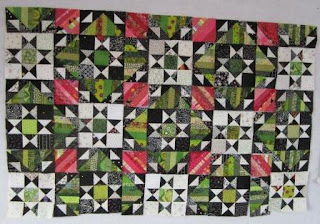 Thanks again Cathy for making aware of this fun on-line mystery quilt.